Yard Waste and Food Scraps-What Goes Into the Green Bin? Don't have room for a compost bin in your backyard? Don't fret – You can still have your green waste and food waste turned into compost! Most cities now offer the three-bin system: Green for Yard Waste and Food Waste, Blue for Recycling, and Gray for everything that ends up in the landfill. Once something is buried in a landfill, it stays there forever. We lose precious resources that could have been reused. In addition, all organic waste (or green /yard waste) breaks down in the landfill to create methane gas. Methane gas better known as Green House Gas (GHG) is 21 times more toxic to the environment than Carbon Monoxide. To help reduce the amount of methane gas going into the environment, we need to help eliminate green waste from going into the landfills. That's why composting is so important, it helps reduce the amount of GHG in the atmosphere, which help reduce the effects of climate change (or Global Warming). The Green Bin is typically call Yard Waste” by most folks but did you know that in Fairfield, you can put all food waste in your Green Bin? 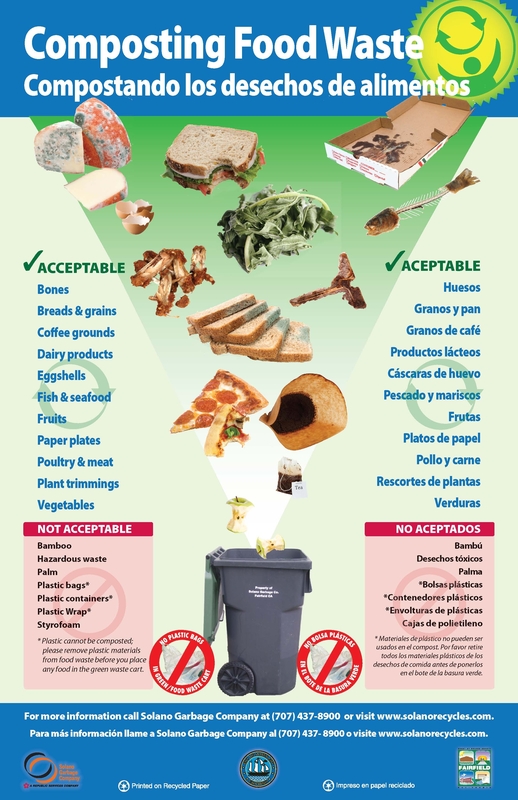 Items you can put in your Green Bin include but are not limited to: cooked and uncooked fruits and vegetables scraps, egg shells, coffee grounds, tea bags, baked goods like crackers and bread, dairy items such as moldy cheese, meat, fish, bones, and that greasy pizza box! Please NO plastic or plastic bags in the Green Bin. 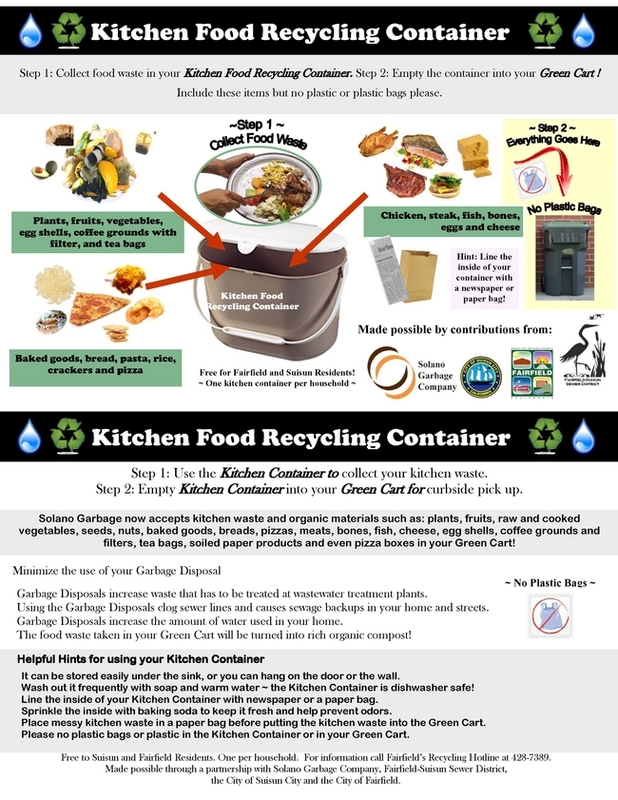 In order to keep your Green Bin clean, wrap up any food waste in newsprint (think sales ads or junk mail), or put the food waste inside an empty carton or box. As long as all the items placed in the Green Bin are organic and bio-degrade, they can be processed into compost. Please note, you would never put dairy, meat or bones in a backyard compost bin. The process used at landfills to create compost is different from a backyard compost pile. I keep my kitchen food scrap in a Recycling Bucket, that I keep under my kitchen sink. I rinse it out when I empty it, and I wash it with hot soapy water every few weeks. You can sprinkle baking soda to help keep it fresh, too. I also rinse out the Green Bin every few weeks to keep it clean. Another trick my friend shared with me, is that she freezes meat scraps and other items during the week, and then place them in the cart the night before their trash and recycling is picked up. Not every city allows all food waste, but most do allow fruits and vegetable scraps to be places in the Green Cart. If you are not sure what you can put in your Green Bin, contact your local recycling coordinator. The City of Fairfield has a Recycling Hotline at 428-7489 for questions regarding food scrap recycling. For other great resources for recycling go to the City of Fairfield's Website at www.fairfield.ca.gov – Keyword – Recycling. http://www.fairfield.ca.gov/gov/depts/pw/utility/recycling/info_resources.asp.